Over the past decade there has been a tremendous rise in the application of behavioural economics to public policy the world over. Combatting known cognitive and perceptual biases in our decision-making processes, the application of behavioural economics to public policy is occurring in diverse settings, from encouraging the timely and honest payment of taxes, to promoting energy conservation at home (BEworks 2014).1 Such public policy has typically emanated from centralised labs or innovation hubs specifically set up within government departments to rigorously trial and disseminate findings from the literature. The most well-known example of these centralised hubs is the UK’s Behavioural Insights Team (BIT). Established in 2010 after Richard Thaler and Cass Sunstein’s book, Nudge, made it onto the UK Conservative Party’s summer reading list, the BIT has been advising the UK government on incorporating findings from behavioural economics (and the behavioural sciences more generally) into its policies (Thaler 2015). The BIT has been remarkably successful in enhancing the effectiveness of public policy in the UK, perhaps best evinced by the demand for its consulting services from governments internationally.2 Many other countries have also followed similar paths to the UK; in 2014, the Economic and Social Research Council estimated that at least 51 countries are home to some type of government-led initiative directly influenced by the behavioural sciences (Whitehead et al. 2014). One of the first explicit Canadian behavioural interventions to this effect involved promoting organ donation registration rates in the Province of Ontario. While much has been written about the power of default options affecting organ donation registration rates (e.g. Li et al. 2013, Johnson and Goldstein 2003), changing Ontario’s current opt-out default policy to one of presumed consent remains publicly unappealing.4,5 Instead, the province sought to promote organ donation registration through a behavioural intervention that operated within the province’s opt-out default policy framework. The intervention was designed with assistance from the province’s recently established Behavioural Insights Unit (BIU) – a government agency established to design and test behavioural interventions in the province. Currently, when conducting a health card, driver’s licence, or photo card transaction at a provincial service-centre, Ontarians are asked by customer service representatives whether they would like to register as a donor and are provided with a registration form. The BIU’s intervention sought to raise registration rates by increasing the salience and simplicity of the registration process through altering the content of the registration form as well as the time at which potential donors received the form during their visit to a provincial service-centre. 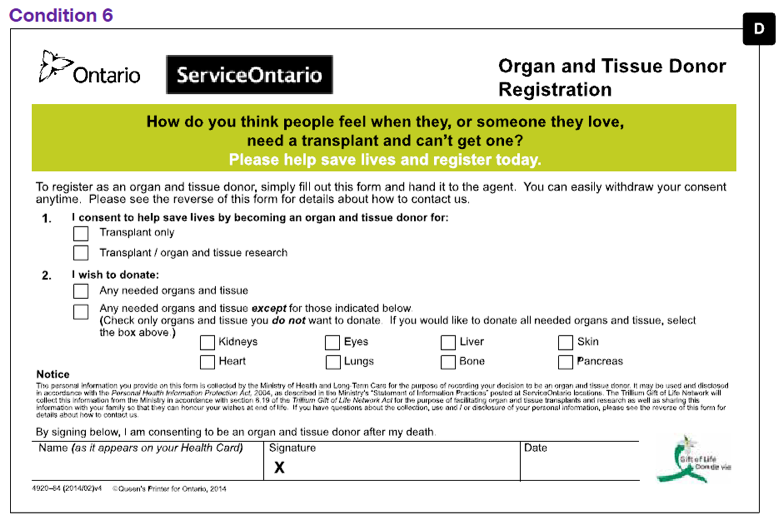 The intervention also included variations in nudge statements present on the registrations forms.6 This simple trial was considered a remarkable success by the Ontario government, as organ donation registration rates increased by up to 143% during the trial (Treasury Board Secretariat 2016). Shu, L L, N Mazar, F Gino, D Ariely and M H Bazerman (2012), “Signing at the beginning makes ethics salient and decreases dishonest self-reports in comparison to signing at the end”, Proceedings of the National Academy of Sciences 109(38), 15197-15200. Treasury Board Secretariat (2016), "Behavioural Insights Pilot Project - Organ Donor Registration". The UK’s BIT has international offices in New York and Sydney, and has collaborated with and consulted for various federal and provincial/state governments; see, for example, http://www.behaviouralinsights.co.uk/who-we-work-with/ and http://www.behaviouralinsights.co.uk/behavioural-insights-team-australia/. Within the province of Ontario, despite their apparent willingness to register, citizens report viewing organ donation as a personal choice and favour the current opt-in default (see https://www.giftoflife.on.ca/img/Opt-In-vs-Opt-Out-Infographic-Dec2015.png).